BTW, I loved your work on SNL. Didn't picture you as a charter. Did picture you as a Bruno Mars fan. Cheers for Uptown Funk, that's a fun one! - The note tubes should be shortened to avoid consonant sounds. - Some Vocal Range Divider events and transposing the HARM1 part down an octave would help readability. Thanks for the advice =) Ill be sure to keep that in mind when working on vocals. May I ask though, what are Vocal divider events? does it just move them an octave higher or lower? The vocal HUD in the RB system automatically finds the highest and the lowest note in a song (excluding notes for non-pitched lyrics) and assigns pitches between them evenly. It works for most songs, but occasionally we need to manually adjust the range. For example, if a song has low range verses and high range choruses, we see all the notes near the bottom of the HUD in verses and near the top in choruses. This would still be okay if the entire range is within 2~2.5 octaves. But if it is wider, it would make it hard to read. To fix this problem, we use the range divider marker, "%". By placing "%" at the end of the last lyric in a phrase, the vocal ranges of the parts before and after the marker get separated. Smaller range helps for players to see pitch changes easily. This function applies only to the static HUD and not to the scrolling HUD. C -2: Range shift: Using this note will reorient the vocal HUD if there is a large shift in the vocal range. By default, when a song has a large range, the vocal HUD will zoom out, making small changes in pitch much harder to read. The HUD does not dynamically zoom in and out, but will set its zoom level at the start of the song based on the maximum range it will need to display. Using the Range shift note will allow the vocal HUD to use a closer zoom level and slide up or down to display the notes in the vocal part. The duration of the MIDI note determines how quickly the Vocal HUD reorients itself. When used correctly, this note will allow you to display all the notes in a song, while keeping the range of the vocal HUD small, which will make small pitch changes much easier to read. Please note that Range shifts are only used when there is a significant change in the range of a song. Note that in this song, the vocal range for the start of the song is shown by the green box. 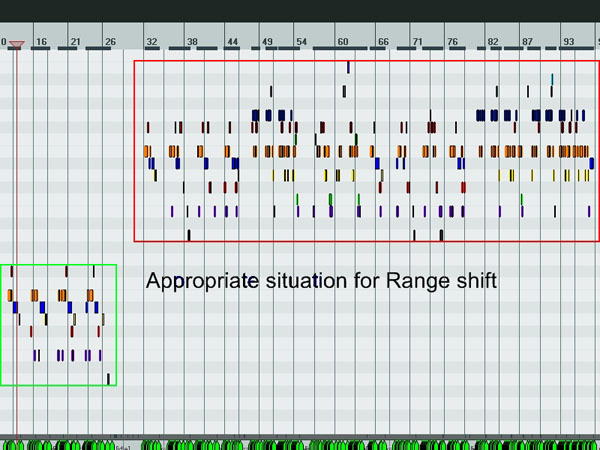 After measure 27, the range of the vocal part shifts dramatically (shown by the red box). Note that thereâ€™s no overlap between the original vocal range and the new vocal range. This is the perfect situation to use the range shift note. With no range shift note, the zoom level of the vocal HUD would be set to show from the very lowest note in the song to the very highest note in the song. If we use the range shift note, the zoom level of the vocal HUD will be set to the size of the red box (the larger of the two) and the vocal HUD will slide up where we place the range shift note. The other option is to move them around by octaves. Scoring-wise the picture in the example would be identical if you just transposed the high part down an octave, but the shift marker gives an extra cue that it is supposed to be sung higher. The relative pitch also informs where the harmony parts will go on the HUD. I will say this now. I am not happy with how drums came out. There are parts where there are bongos playing (when it dies down for example) and I would have charted that, but it was too hard for me to make out and so I just put a hi-hat section which is in there, but I would have prefered to do the other part. If anyone wants to give it a go and chart feel free to ask for the files. Of course, once again the vocals are from a MIDI, so any errors please let me know! what about You & I by santana and chad too ? These are some nice tracks! Another awesome choice Santana is always great on guitar and Chad is always pleasant to sing. Thanks for sharing! Heck yeah, Santana! Thanks for all of these full band customs! My playgroup loves 'em. Haha finally an Ed Sheeran song! Ironically I've also got a friend who is a huge fangirl and literally listens to his songs every time she drives. Despite that, this is still a fun song to play and it will be a major hit in the upcoming parties.